Finding good quality gluten free food when on holiday can be a challenge. 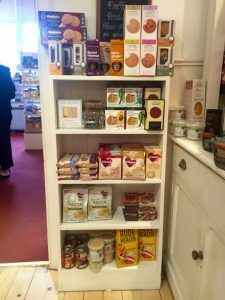 I have just enjoyed a great weekend away close to Aviemore and have made some cracking gluten free finds in the Rothiemurchus Estate Farm Shop. Packed with local produce including venison chorizo, homemade jams, great cheeses and fish, this is a good spot to fill up on some quality food either on your way north or when staying in the area. There is a wonderful selection of some of the best Scottish gins, lots of lovely looking snacks and crackers, plus other treats. A highlight is a pretty extensive gluten free corner, which also stocks large bags of gluten free gnocchi. The service is very friendly and there is a nice gift shop and a very good cafe, which had some delicious GF lemon drizzle cake. The Rothiemurchus Estate Farm Shop is only 5 minutes off the A9, so you could drop in as you head north, or just put it on your food-buying itinerary if staying near by.